In the heart of Provence, in the historical centre of Avignon, 5 minutes from the Popes’ Palace. 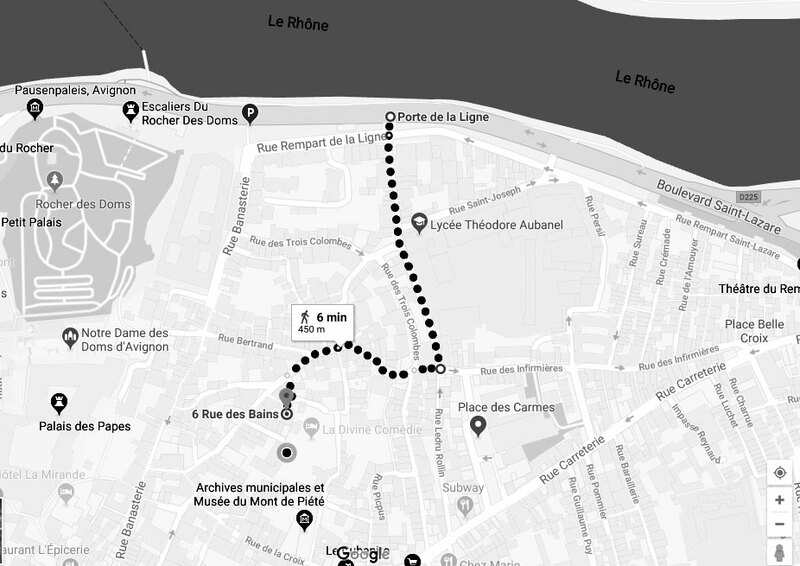 Then follow Avignon-centre. Take Porte de La Ligne, follow rue de la Palapharnerie, take the 2nd on the right direction Place des 3 Pilats. On the left, follow rue Sainte-Catherine. Take the 2nd left onto Rue des Bains. The car park is located behind the black gate. Contact us on +33 (0)6 77 06 85 40 once you arrive. Follow Avignon centre historique / Barthelasse. Stay in the left lane towards Boulevard de l’Oulle, boulevard Saint Dominique. Continue straight ahead (you will drive under the Pont d’Avignon) until Porte de La Ligne. Follow rue de la Palapharnerie, take the 2nd on the right direction Place des 3 Pilats. On the left, follow rue Sainte-Catherine. Take the 2nd on the left onto Rue des Bains. The car park is located behind the black gate. Contact us on + 33 (0) 6 77 06 85 40 once you arrive.